Well, it's time again for another competition - gleaned via Death by Architecture. Sponsored by Transportation Alernatives, the Designing the 21st Century Street Design Competition challenges entrants to envision: "...new conceptual and physical approaches to the planning of public streets." 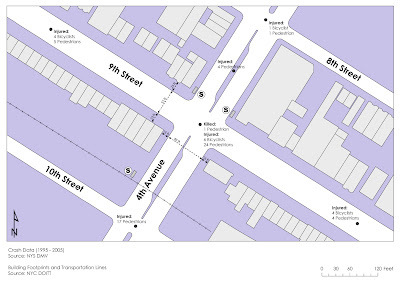 The competition focuses on an intersection in Brooklyn, at the corner of 9th Street and 4th Avenue, which has a criss-crossing web of pedestrian, bicycle, auto, and truck traffic making their way through this mixed use neighborhood. "Since the early 1900's, multipurpose streets originally designed to accommodate multiple modes of transportation were increasingly reshaped to prioritize motor vehicles. As motor vehicle use increased, more and more street space became designed to maximize vehicle speeds and vehicular parking to the detriment of the safety and comfort of pedestrians and bicyclists. Yet this longstanding philosophy conflicts with today's 21st Century vision of a New York City that is sustainable, healthy and equitable. Clearly there is a need to devise new street designs to meet new challenges and accommodate all users, not just those who drive. We challenge you to think of our streets in a 21st Century context. Multiple users must be balanced once more and decades of motor vehicle prioritization reversed. We must think of our streets as first serving the basic needs of pedestrians, then bikes, then cars, but towards a balance of providing for all functions. The purpose of this competition is to generate viable street design options that are more suited to a modern vision of our city. This begins by designing streets that integrate the needs of all users, address the problems of automobile congestion and pollution, and aim for quality of life benefits such as greater sociability, activity and economic development. This is a necessary step towards a greener New York and healthy, sustainable communities." The are has had it's share of multi-modal conflicts, as one of the diagrams outlining injury and deaths in the area related to transportation. The jury includes the following: Jan Gehl, Alex Washburn, Michelle de la Uz, Sam Schwartz, Andy Wiley-Schwartz, David Burney, Karen Lee, Brad Downey, Leon Reid IV and Joan Byron. With a very good supporting local cast, Jan Gehl is the obvious star of the show. It's fitting that a recent post from Archidose explains that Gehl has been hired by NYC to consult on transportation issues: "...beyond the intended consequence of actually improving the streets -- is that the plans being implemented spark discussion, they make it into the news. And discussion and exposure around urban design, to me, is a good thing." The NY Times recently featured one of these projects that Gehl is working on is being discussed. Some additional images and words from Archidose. 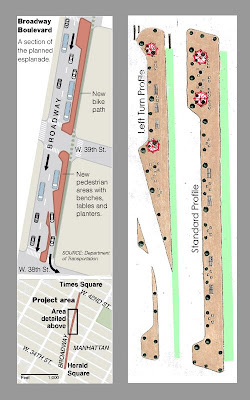 "One plan underway is the closure of a portion of the west side of the roadway on Broadway between 42nd and 34th Streets, in order to create a bike lane and "pedestrian living rooms." 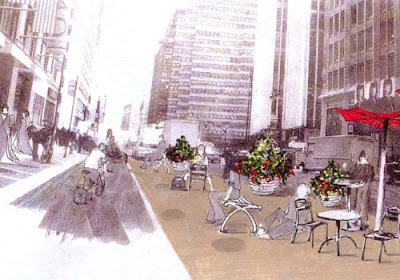 The green strip above will become the bike lane, with planters taking the place of the orange and white striped construction bollards, to buffer people sitting on cafe chairs in the new pedestrian strip, per the rendering below." "Locating seating in a narrow strip between two types of fast-moving traffic is the most questionable and controversial aspect of the plan, over the apparent increase in congestion that people incorrectly anticipate with fewer lanes of southbound traffic. (If anything, examples around the city -- Greenwich Village in particular -- show that fewer lanes reduces congestion, while an increase in lanes leads to an increase in traffic and congestion, a fact many people fail to accept.) Parked cars, while less than desirable in some respects, work as a buffer between pedestrians and cars; in August, when the improvements are complete, we'll see how willing people are to do without that buffer." The interesting aspect of removing traffic lanes and separating these zones with planters is controversial but pretty smart. As mentioned in the Archidose post, the reduction of lanes = reduction of traffic and congestion is a hard pill for road advocates to swallow. There is also the removal of parking (which is another one of those fables of planning favored by business owners - which also double as a buffer from pedestrians and traffic. This requires landscaping to take the place of something done previously by cars - which is a benefit in most people's minds. From the NYT: "The planters are a key part of the design because they will be the only thing separating the expanded pedestrian areas from the cars and trucks zipping by." Definitely a timely option for the competition - although Broadway and the project site a very different in nature. In maintaining the competitive spirit, I'm going to keep ideas to myself for now - as a group of us at work are going to give it a go. It's a quick timeline, and a very open-ended submittal, including just a handful or images and a 500 word description. While I have no illusions of picking up another win, the point of competitions (by the definition) are of course to win (and the . The added value of the endeavor is to provide an outlet to pursue ideas and methods that are not specifically part of the day to day work (or school). Win or lose, I'll post the concepts we come up with - as well as others when presented. Moments after posting this article, I had a post appear from cityofsound, with a link to some additional info on the Broadway Boulevard proposal - along with some great quotes from William 'Holly' Whyte. A must to add (via NY Sun) - from Whyte's 1977 collection of essays "The Essential William H. White." "The pedestrian is a social being; he is also a transportation unit, and a remarkably efficient one. … Most transportation experts, however, scant the pedestrian and his potential; millions are being spent in research on new kinds of people-movers but very little on the oldest and best kind: people themselves." And a further reference in the Sun: "Whyte mentored Jacobs in the days before her famous book, "The Death and Life of Great American Cities," was published, and like Jacobs preferred to understand how cities work by personally observing social interaction and public spaces, rather than by relying exclusively on statistical analysis based on averages and aggregates. Any serious student of cities should be familiar with his work. Also like Jacobs, Whyte concluded that what makes a city great is the life that goes on in its public spaces." "Thus..." again from Whyte: "Study the social behavior of the pedestrian and you find that a significant part of his activity is not moving, but standing, talking, and looking. 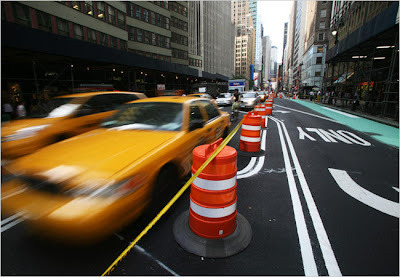 Much of the congestion of busy streets is traceable to this behavior." "A salute to grass. It is so adaptable; fine for sitting, napping, sunbathing, picnicking, and Frisbee playing. Like chairs, it provides a limitless choice of arrangements." "Girl watchers put on a show of girl watchers looking at girls. But it is all machismo. We have never seen a girl watcher make a real pass at a girl."